Great-uncle David was my grandmother Julie (Vanasse) Belair’s youngest brother. Some of the family spelled their last name Vanasse, others spelled it Venasse. David, the eighth of nine children of Olivier and Elizabeth (Vanasse) Vanasse, was born on 3 May 1903 on Ile des Allumettes, Pontiac County, Quebec. He married Louise St-Martin in June 1929 and they adopted a son, Glen. I don’t think I ever met David or Louise, but my Dad used to talk about his Uncle Dave to me. David’s death was a great blow to his wife Louise and to his surviving sisters Celia and Agnes, who were devoted to their brother. 1. Agnes (Vanasse) Burchill (Ottawa, Ontario) to “Dear Joan”, letter, 1 June 1979; privately held by Yvonne (Belair) Demoskoff, British Columbia, 2016. Yvonne received assorted family memorabilia, including this letter, from her aunt Joan (Belair) Laneville when she visited her home in May 2014. Joan was Agnes’ niece. 2. 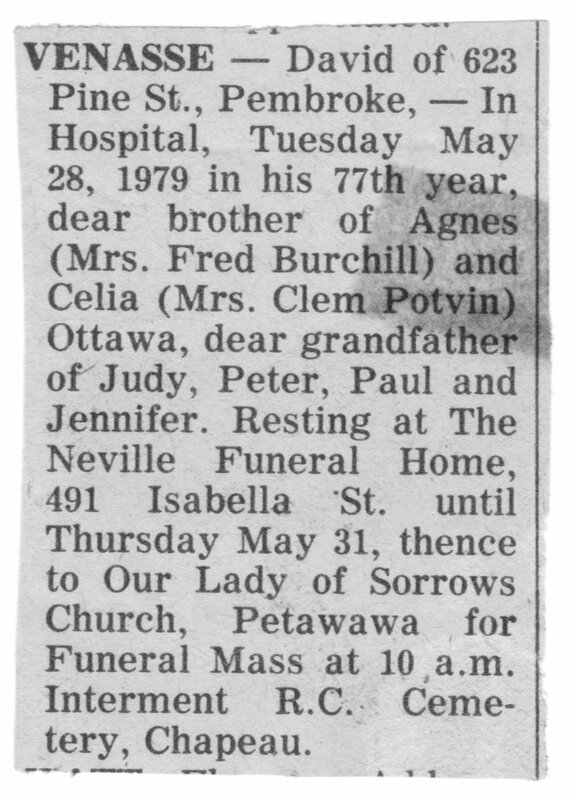 “Venasse”, obituary, undated clipping, 1979, from unidentified newspaper; privately held by Yvonne (Belair) Demoskoff, British Columbia, 2016. 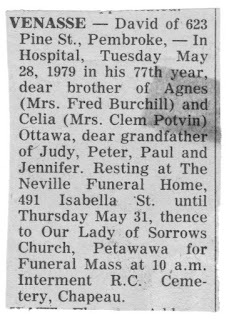 Yvonne received assorted family memorabilia, including this obituary, from her aunt Joan (Belair) Laneville when she visited her home in May 2014. Joan, David’s niece, received it from his sister Agnes (Vanasse) Burchill in a letter to Joan dated 1 June 1979.